As veterans gather for a ceremony to mark the 60th Victory in Europe anniversary, one from south Wales has more reasons than most to remember. Derek Knee was just 22 when he was the Army interpreter at the Luneburg Heath surrender by Germany. Now, 60 years on, he is the only person still alive of the group of German and British military who stood for hours negotiating the peace in the woods. 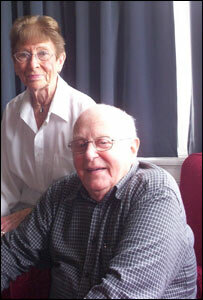 Mr Knee and his wife Margaret, from Barry, were at the London reception. He was a student of French and German at Cambridge University who had, like so many others, become caught up in the conflict. A whole summer spent with a family in Germany had helped make him fluent in the language, but he was not fully prepared for the task handed down to him. "My commanding officer told me go down to Montgomery's office. He didn't say what for but that was the nature of the Army, wasn't it? You just did what you were told," said the former intelligence officer. Mr Knee found himself in the middle of the woods at Luneburg Heath, the only person who could understand both the field marshal and the three-man German delegation. 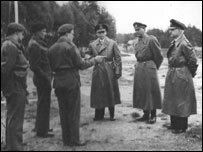 Montgomery was demanding an unconditional surrender and the German officers said they were not qualified to offer it. "Montgomery gave them a good lunch - a bottle of wine and even a glass of cognac each to make sure they were in a good mood when they came back". After lunch, the peace talks moved inside to Montgomery's impressive carpeted tent, complete with flowers on the table. With the aid of maps, the British officers impressed on the Germans the extent to which the Russians were also advancing on their forces from the east. "They explained they did not have the authority to negotiate this unconditional surrender but if Montgomery insisted they would go back to their HQ and get permission from Doenitz, the new leader of the German people, Hitler having died days before," said Mr Knee. "They came back on the second day with an extra delegate and said that Doenitz had agreed." Mr Knee added: "Montgomery had insisted on drawing up a second surrender document. He was very strict about it. "The only thing was there was a mistake on it in the date, which he had to scribble out and correct". A couple of weeks later Mr Knee was one of the contingent who went to arrest Doenitz and the rest of the German government in Flensburg. He witnessed Friedeburg, one of the three who had signed the peace agreement, committing suicide with a cyanide pill. After the war, Mr Knee returned to Cambridge and, abandoning his languages degree, studied economics instead and went on with wife Margaret, whom he had met before the war in Barry, to travel widely advising the principal department stores in Europe. The couple joined around 100 veterans at the Victory in Europe reception at the Imperial War museum in London on Wednesday. Mr Knee has never been able to forget his role in the Luneburg surrender and has regularly been asked to receptions marking the war, and has become a prominent interviewee for war events. "I wouldn't want to forget, of course, but to be honest the memories are fading," he said.